If you remove the mods one by one and find which is interfering with StepUp, I would ask you to let me know which it is so I may look a little into it. Thanks. Which mod did you add? 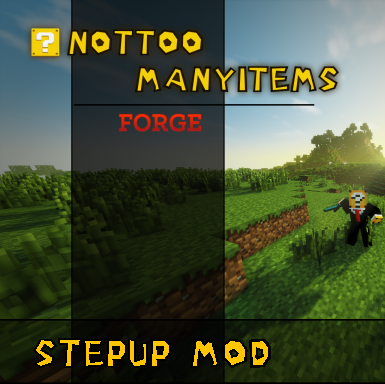 The mod shouldn't stop working unless you are using another mod which modifies the same variable StepUp modifies. In which case they would cancel each other. Thats just it, No mods added, only updated. Though I did update forge as well, have not had an opportunity to downgrade forge to test yet. I've got something I've noticed. StepUp stops working when Ice and Fire is installed. The mod is active and you can toggle through the modes with J, you just can't walk up blocks with the StepUp mode. If I disable the Ice and Fire mod StepUp works again. That was it, I did not think I had Re-added Ice and fire (removed it while having issues with the dragons stuttering mid flight) re-removed and step up is working again, Thanks Eirikur! Thanks! I'm looking into the Ice and Fire source code to see if there's a way both mods can work together. I have released a version of Ice and Fire that should work with step assist mods. Check it out and let me know how it goes for you. Had a chance to test it, looks like I am getting a odd error relating to the cockatrice with the test fix build. Someone else told me they had the same issue with aether_legacy on the github page. However, I have no idea what that is about as I just forked the github version of Ice and Fire and modified only where was needed for step assist. That error must be in the master version of the ice and fire github repo. Which may not be ready for full release as it is. All errors that come from my version, as long as they aren't step assist related or caused by my code changes, may or may not be addressed by me in the future as ice and fire is not my mod to fix. 100% agree, the effort is far more than I expected and could ask for, thank you so much for making the fork! - Option to send the toggle message as a status message. - Option to disable the message when a world is joined. - Make the messages configurable or put them in en_us.lang. 1. Not sure what you mean by status message. 2. I may create a value for it in the config. 3. This is such a simple mod that I don't see a reason to allow the three messages to be configurable. However, I will take ideas for what they could be changed to. In 1.12, you can call EntityPlayer.sendStatusMessage(ITextComponent, true). "Auto jump disabled", "Vanilla auto jump enabled", "StepUp auto jump enabled" are what I would have changed the messages to, but if you don't want to do that, it's fine. Where is your issue tracker? Most mods use Github. I wanted to make a feature request. When I sneak and walk up against a 1 block height block, I expect to not step up onto that block. I understand that there is a toggle to turn it off, but I want to turn it off at the flick of a pinky finger on the shift key at a moment's notice. 2. I can replicate walking up a block while crouching and never really thought about it as being something that shouldn't happen. The next version will not allow step up while crouched. 3. You can change the keybind for StepUp in the controls menu to any other button Minecraft will allow. That's awesome! I just downloaded the update. Can't wait to try it out.